It’s fresh cuts time at Anthropologie — lots of new sale items to comb through and decide what, if anything, might be worth picking up at the sale price. The outfit above, featuring the Striped Open-Shoulder Pullover (now $80), the Relaxed Chino Shorts (now $30) and the Skinny Tab Belt (still full price at $38) caught my eye as a cute look. What else caught my eye? Read on. There are several interesting dresses (many annoyingly online-only) that might be worth a shot now that they’re on sale and there’s always Free Shipping on orders of $150+ for Anthro loyalty members. Above, the Bianca Flounced Midi Dress (now $160) could be a great day-to-evening dress with a blazer — here’s an option that speaks very well to the dress. Another dress option catching my eye is the Ocala Halter Dress (now $100, above) by junior’s brand Foxiedox. I own another Foxiedox dress from earlier this year — seen on me here — and I had to go up to the XL to make it work (especially on length!). The Ocala looks like a great date dress. Another blue dress I’m leaning towards picking up is the Cloth & Stone Chambray High-Neck Swing Dress (now $90) because I ADORE this style of dress. I have a similar dress from Cloth & Stone — on me here — and would love to have this one as a backup. For days around town, the Lace Halter Mini Dress (now $100) looks ideal, is fully lined, and has a slightly heavier weight that will be perfect for transitioning into Fall. Lots of jewelry went on sale today too to complete the look, including really cute earrings like the Navy Tandem Hoop Earrings (now $30) and the DaVinci Pentagon Hoop Earrings (now $50). You’ll see new sale goodies from brands we love here in this community like Sibilia, Gas Bijoux and Ela Rae. 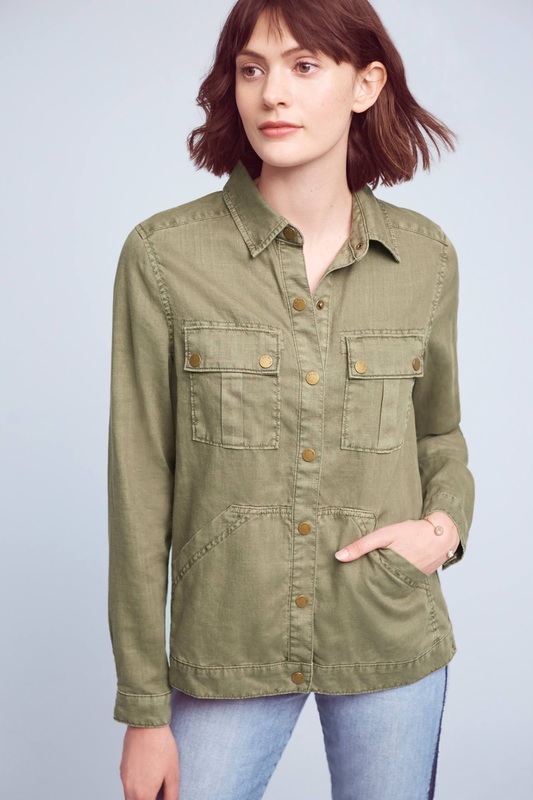 On the casual side, the highlights for me include Level 99’s Military Shirt Jacket (now $70, see the sand color on me here) which runs true to size and is an awesome lightweight top layer. I also wear mine to the beach to keep the sun off as needed. Level 99 has another appealing option in the Linen Shorts (now $50) which come in many cute colors and would go well with the Linen Swing Top (now $40). I also see potential winners in the Londra Layered Top (now $40) and from Pilcro, the Script High-Rise Crop Jeans (now $80) and the Hyphen Mid-Rise Denim Short (now $40). 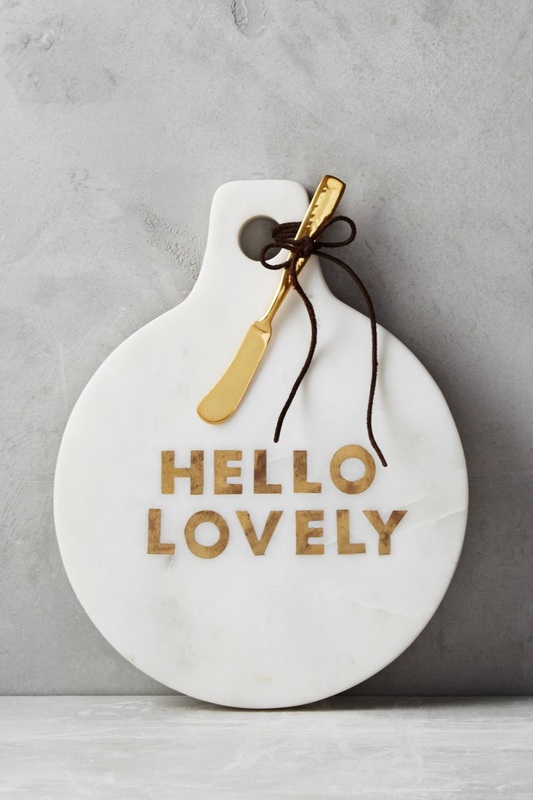 You’ll find some cute home markdowns too, topped for me by an item I already own and adore, the Gilded Greetings Cheese Board (now $40, above). You may be wondering if an extra % off sale is in our future and I believe it is. If you’re wondering whether to make a purchase now or wait, I’d say do it now knowing you have 14 days to get a price adjustment or make a return if needed. I have to think we’ll see that extra % off within the next two weeks. What do you think? Below, all my sale picks from the fresh cuts section. I'm only interested in the jewelry right now. Short wide off shouytops are a big NO for me. Ditto, Nam. Got a few pieces of jewelry and a pair of jeans, but zero interest in the clothing. Also, once the first whiff of fall appears, I want nothing to do with summer things anymore. Agree. It's amazing how ugly I'll fitted clothes Anthro is carrying lately. I didn't buy anything except Ranna gills dress for an event and jewelry. I too really wanna see what Anthro has to offer in fall?? I am the exact same way—-I can't buy any "summer" anymore 😉 I am so excited to head into fall all of a sudden! It's getting really sad. I stopped into the Rockefeller Center Anthropologie yesterday, which is huge, and I couldn't find one single thing I wanted to try on. Interested in much less than I used to be and most everything I want to try is online only. Hoping things get better as we ease into fall, but not getting my hopes up. I used to check my wishlist daily and haven't looked at it in a very long time. No more fun w/very little pop-backs and nothing new sparks my interest. So disappointing. Is there a reason there are so few pop-backs these days? I agree with you Roxy. The only items I have purchased in a bit are the michael stars rushed dresses which flatter me and are a reasonable price. They are not an anthro only brand and I purchased here with recent 20% off's. i have purchased quite a bit at the nordstrom sale. Bras, undies, active wear (a lot of nike), sneakers (for everyone in my family), and a couple of James Perse jackets for work. I got the Summer Breeze dress that I've been wanting all summer! Also got the Briella tunic dress. Hope there's a percent off coming soon lol. Me too! I also got the summer breeze dress in black and yellow. And I also got the Eva Franco bird jacquard dress. Great pickups! I hear really good things about the Summer Breeze Dress. Nope, it looks terrible on me too. It shows way too much cleavage in my opinion. I sized up a size and it was still tight and unflattering. Loved the black/yellow print, though. Looked terrible on me too–I tried a regular and petite and tried both colors—–I am have a straight figure and am petite. I didn't care for either color way either. I got the farm rio Havana floral dress. 100 % cotton and I love the weightlessness of it and print and the Pom poms are a whimsical touch. I'm hoping for a percentage off soon bc $100 is still a lot for a dress. I love Pilcro jeans but has anyone else noticed that they now pill horribly in the thigh/crotch area? To the point of wearing out holes in three months time! I hope not – I just bought a pair! But it's not just Pilcro. I've been having the same problems with Lucky jeans, which used to be my go-to brand. I still buy them because they fit really well, but I won't pay much for them because they don't last. I think alittle stretch is fine, don't get me wrong..but give me more cotton they last so much longer. I bought two pairs of DL 1961 jeans (boot and straight) earlier this year and wear and wash all the time-amazing quality. they do not stretch out at all and no pilling. These are my new go to brand. Nordstrom's sells the brand. What is going on with the website today?? It won't keep me logged in and I can't add more than one item to my cart or add things from my "saved for later." Anyone else having issues? I'm having issues too! I can't log in. I have been having this issue for about 2 weeks and have been corresponding with customer service, which just asks me questions with no real answers. I have to sign in every time I go on the site, my shopping cart is only occasionally still there and my Saved for Later comes and goes. All my account info is accurate but the basket and Later basket are not there. I explained to them that I CANNOT BUY ANYTHING if my shopping cart keep merchandise in it. Any word on a percentage off this week? I want a PA!